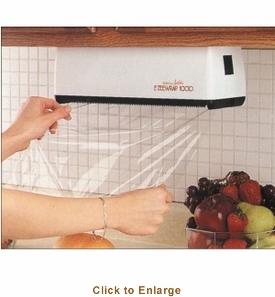 You�re viewing our Sausage Maker E-Zee Wrap 1000 plastic wrap dispenser. E-Zee Wrap is a hands free operation that is easy to use and allows you to control the amount of plastic wrap you need with precise cutting. Mount the plastic wrap dispenser under a cabinet, on the wall, or place on the countertop. Easy to refill. Includes one 11" wide 1000 ft. roll of wrap. Our plastic wrap dispenser comes with a manufacturer warranty. If you have questions about our products we have the answers you need. 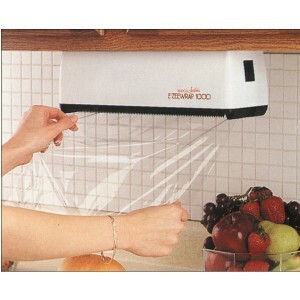 Scroll down to view our Sausage Maker E-Zee Wrap 1000 plastic wrap dispenser. Dimensions: 4"L, 13"W, 4"H.